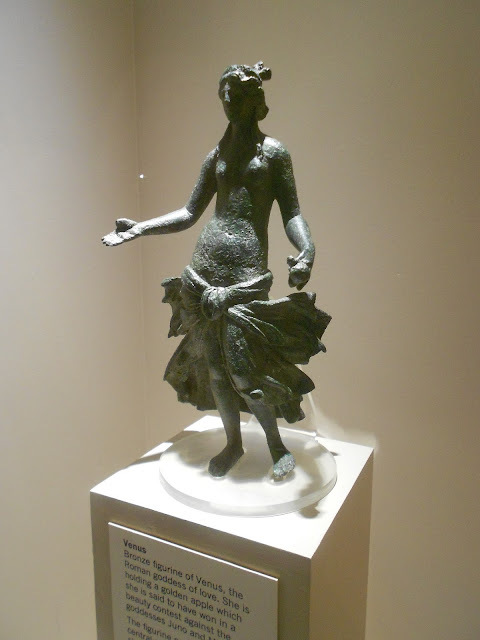 The Rokeby Venus, yes, the Venus de Milo, yes, but the Verulamium Venus? She's to be found in the Verulamium Museum in St Albans, and in my eyes stands comparison with other more famous Venuses. (Some claim she represents Proserpina holding the pomegranate from which she ate six seeds in the Underworld.) 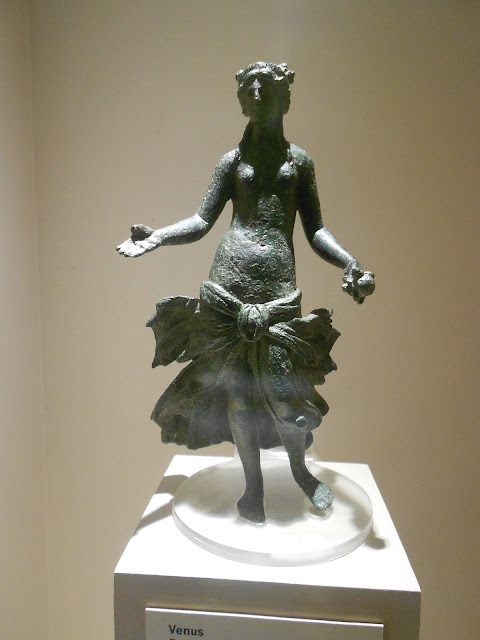 She is small (less than a foot tall) and made of bronze; she dates from the 2nd century CE. She holds in her left hand the golden apple awarded to her by Paris, the Prince of Troy, as the winner of a beauty contest. She makes an open-palmed gesture with her right hand, as if appealing to the viewer. I have to say that I’m with Paris, despite the fact that she doesn’t entirely conform to 21st century ideals of female beauty. I feel very ungallant in pointing out that she has very wide hips, no waist to speak of, and isn’t at all buxom. Also her left leg seems rather awkwardly posed, though this is obscured by the baroquely billowing robe that hangs so seductively on her hips and is such an eye-catching feature of the figure. Nevertheless, despite these ‘faults’ (or maybe because of them) I find her alluring and endlessly fascinating. 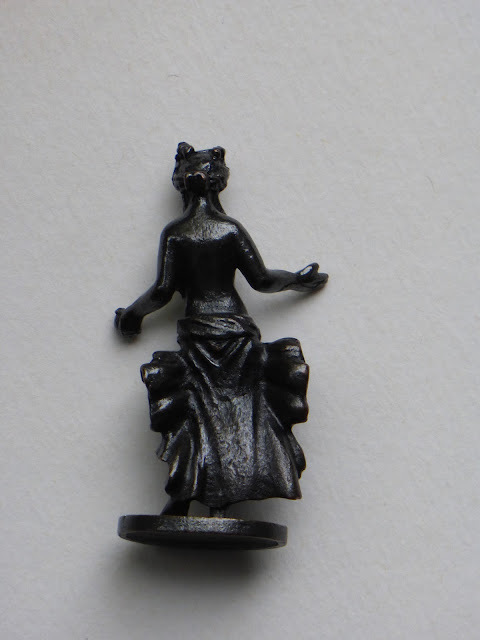 She was found during an excavation of what was probably a collection of scrap metal waiting to be melted down and reused. How could such a beautiful object ever have been thrown away? And, once discarded, why was she never recycled? Perhaps she exercised her charm even from the depths of a bin of rubbish and contrived to survive to draw visitors to her many centuries after she was made. Replicas of her were at one time available in the museum shop, (though they seem to have disappeared recently), and one of them is the tutelary deity on my desk as I write these words. It’s a shame that she is displayed in a case that prevents her from being seen from any angle except the front. Free standing sculptures need to be seen from all round. The lighting isn't perfect either. The picture below is of my replica, just to give some idea of what he looks like from a different angle. The Verulamium Museum is full of wonderful things, especially mosaics, but Venus outranks them all.